Algebra and Base Ten Blocks, What's under the cup? Here we introduce algebra concepts without even trying. We are just playing. The idea here is simple PLAY! You can play with anybody anywhere...all you need is a set of blocks for each participant, and away you go! At this point with the student they rarely even need to see the symbols and we say 6 plus what is 14...or we can tell a story, we have 14 people but only six cookies how many more cookies do we need? When they do see the symbols the symbols make sense. Basically it's controlled chaos...but playing math doesn't have to be orderly and silent. I'd argue more learning takes place at this age playing and being rambunctious than sitting with a worksheet in silence...MUCH MORE. A very simple variation on the theme. Here we can learn addends, multiplication and some algebra too. 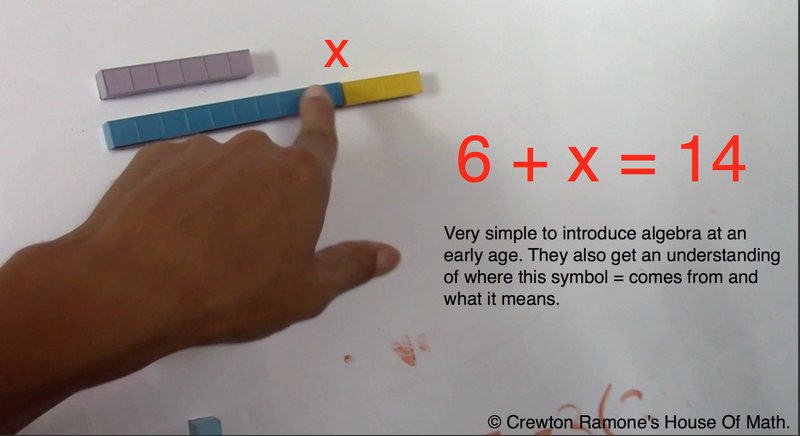 And we learn how to ask and answer questions mathematically, soon we will relate them to the symbols. 3x = 15 for example, We could skip count the 3's. The sound effects just make it that much more FUN. These kids are separated by half an ocean and half a continent...video tutoring can give you child an actual head start, or give you as a parent an idea of how easy it is to get started...get a few lessons and then do it on your own...so many parents tell me they don't know how to play math or make it fun because they have absolutely no experience with math being fun. I can show you how and give you a few tips and pointers. Or you could just get a password and you can watch the vids on Rayond's Page and others...there are tons of sample lessons (that page has over 10 hours of video on it) and that's just for starters. The idea is GET STARTED. Don't be overwhelmed, just take a bite at a time. Here is another bite basically the same thing just a slight bit more emphasis on introducing a 4 year old to problem solving. Rarely too early to start, but often too late.